Taipei (), officially known as Taipei City (Chinese: 臺北市 or 台北市; pinyin: Táiběi Shì; Pe̍h-ōe-jī: Tâi-pak Chhī), is the capital of Taiwan, a sovereign state in East Asia officially known as the Republic of China. Situated at the northern tip of Taiwan, Taipei is located on the Tamsui River; it is about 25 km (16 mi) southwest of Keelung, a port city on the Pacific Ocean. It lies in the Taipei Basin, an ancient lakebed bounded by the two relatively narrow valleys of the Keelung and Xindian rivers, which join to form the Tamsui River along the city's western border. The city proper is home to an estimated 2,693,672 people. Taipei, New Taipei, and Keelung together form the Taipei–Keelung metropolitan area with a population of 6,900,273, the 40th most-populous urban area in the world. They are administered under three municipal governing bodies. "Taipei" sometimes refers to the whole metropolitan area, while "Taipei City" refers to the city proper. Taipei City proper is an enclave of and surrounded on all sides by another city called New Taipei. Taipei is the political, economic, and cultural center of Taiwan. Considered to be a global city, Taipei is part of a major industrial area. Railways, high-speed rail, highways, airports, and bus lines connect Taipei with all parts of the island. The city is served by two airports – Taipei Songshan and Taiwan Taoyuan. Taipei was founded in the early 18th century under the Qing Dynasty rule and became an important center for overseas trade in the 19th century. The Qing Dynasty made Taipei the provincial capital of Taiwan in 1886 when Taiwan was separated from Fujian Province to be its own province of the dynasty. Japan acquired Taiwan in 1895 from Qing Dynasty under the Treaty of Shimonoseki after the First Sino-Japanese War. Taiwan became a colony of Imperial Japan with Taipei as its capital, in which Taipei was administered under the Taihoku Prefecture. Taiwan's Japanese rulers embarked on an extensive program of advanced urban planning that featured extensive railroad links. 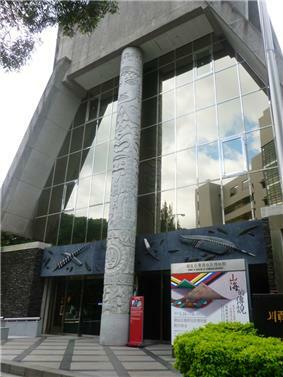 A number of Taipei landmarks and cultural institutions date from this period. 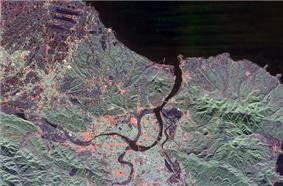 The region known as the Taipei Basin was home to Ketagalan tribes before the eighteenth century. Han Chinese mainly from Fujian Province of Qing dynasty began to settle in the Taipei Basin in 1709. In the late 19th century, the Taipei area, where the major Han Chinese settlements in northern Taiwan and one of the designated overseas trade ports, Tamsui, were located, gained economic importance due to the booming overseas trade, especially that of tea exportation. 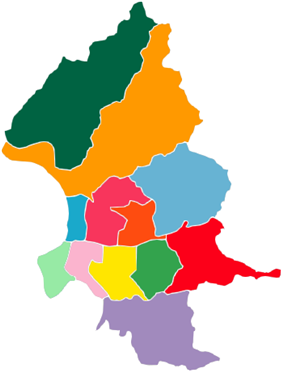 In 1875, the northern part of Taiwan was separated from Taiwan Prefecture and incorporated into the new Taipeh Prefecture as a new administrative entity of the Qing dynasty. Having been established adjoining the flourishing townships of Bangka, Dalongdong, and Twatutia, the new prefectural capital was known as Chengnei (Chinese: 城內), "the inner city", and government buildings were erected there. From 1875 (still Qing era) until the beginning of Japanese rule in 1895, Taipei was part of Tamsui County of the Taipeh Prefecture and the prefectural capital. In 1886, when Taiwan was proclaimed a separate province, Taipei City was made the provincial capital. Taipei remained a temporary provincial capital before it officially became the capital of Taiwan in 1894. All that remains from the Qing era is the north gate. The west gate and city walls were demolished by the Japanese while the south gate, little south gate, and east gate were extensively modified by the Kuomintang (KMT) and have lost much of their original character. As settlement for losing the First Sino-Japanese War, China ceded the island of Taiwan to the Empire of Japan in 1895 as part of the Treaty of Shimonoseki. After the Japanese take-over, Taipei, called Taihoku in Japanese, was retained as the capital and emerged as the political center of the Japanese Colonial Government. During that time the city acquired the characteristics of an administrative center, including many new public buildings and housing for civil servants. Much of the architecture of Taipei dates from the period of Japanese rule, including the Presidential Building which was the Office of the Taiwan Governor-General (Japanese: 台湾総督府〔臺灣總督府〕). During Japanese rule, Taihoku was incorporated in 1920 as part of Taihoku Prefecture (Japanese: 台北州〔臺北州〕). It included Bangka (艋舺), Twatutia (大稻埕), and Jōnai (城內) among other small settlements. 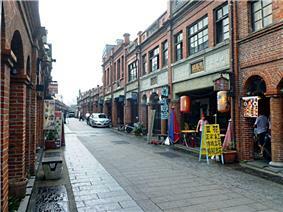 The eastern village Matsuyama (松山庄) was annexed into Taihoku City in 1938. Upon the Japanese defeat in the Pacific War and its consequent surrender in August 1945, the Kuomintang (Chinese Nationalist Party) assumed control of Taiwan. Subsequently, a temporary Office of the Taiwan Province Administrative Governor was established in Taipei City. In 1947 the KMT government under Chiang Kai-shek declared island-wide martial law in Taiwan as a result of the 2-28 Incident, which began with incidents in Taipei but led to an island-wide crackdown on the local population by forces loyal to Chiang. Two years later, on December 7, 1949, Chiang and the Kuomintang were forced to flee mainland China by the Communists at the Chinese Civil War. The refugees declared Taipei to be the provisional capital of a continuing Republic of China, with the official capital at Nanjing (Nanking) even though that city was under Communist control. Two peaks, Cising Mountain and Mt. Datun, rise to the northeast of the city. Cising Mountain is located on the Tatun Volcano Group and the tallest mountain at the rim of the Taipei Basin, with its main peak at 1,120 metres (3,670 ft). Mt. Datun's main peak is 1,092 metres (3,583 ft). These former volcanoes make up the western section of Yangmingshan National Park, extending from Mt. Datun northward to Mt. Caigongkeng (菜公坑山). Located on a broad saddle between two mountains, the area also contains the marshy Datun Pond. Taipei has a monsoon-influenced humid subtropical climate (Köppen: Cfa). Summers are long, hot and humid, accompanied by occasional heavy rainstorms and typhoons, while winters are short, generally warm and generally very foggy due to the northeasterly winds from the vast Siberian High being intensified by the pooling of this cooler air in the Taipei Basin. As of the rest of Northern Taiwan, daytime temperatures of Taipei can often peek above 26 degrees Celsius during a warm winter day, while it can dip below 26 degrees Celsius during a rainy summer's afternoon. Occasional cold fronts during the winter months can drop the daily temperature by 3 to 5 degrees Celsius, though temperatures rarely drop below 10 degrees Celsius. Extreme temperatures ranged from −0.2 °C (31.6 °F) on February 13, 1901 to 39.3 °C (102.7 °F) on August 8, 2013, while snow has never been recorded in the city besides on mountains located within the city limit such as Mount Yangmingshan. 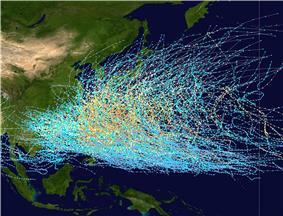 Due to Taiwan's location in the Pacific Ocean, it is affected by the Pacific typhoon season, which occurs between June and October. Motor vehicle engine exhaust, particularly from motor scooters, is a source of air pollution in Taipei. The levels of fine particulate matter, including PAHs, are consistently more serious in the mornings as there is less air movement; sunlight helps clear up some pollutants, which tend to be trapped close to the ground. When compared to other Asian cities, however, Taipei has "excellent" capabilities for managing air quality in the city. Occasionally, dust storms from Mainland China can temporarily bring poor air quality to the city. 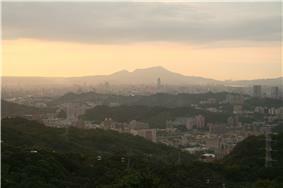 Taipei viewed from Tiger Mountain, with Taipei 101 on the left-central of the image. Taipei City is home to 2,695,007 people, while the metropolitan area has a population of 7,028,583 people. The population of the city proper has been decreasing in recent years while the population of the adjacent New Taipei has been increasing. Due to Taipei's geography and location in the Taipei Basin as well as differing times of economic development of its districts, Taipei's population is not evenly distributed. The districts of Daan, Songshan, and Datong are the most densely populated. Despite the Asian financial crisis, the economy continues to expand at about 5% per year, with virtually full employment and low inflation. As of 2007, the nominal GDP of the core city of Taipei has accrued to nearly US$160 billion, while the metro region of Taipei has a GDP (nominal) of around US$260 billion, a record that would rank it 13th among world cities by GDP. The GDP per capita of Taipei is US$48,400, and the second highest in Asia behind Tokyo, which has a GDP per capita of US$65,453. Services, including those related to commerce, transportation, and banking, have become increasingly important. Tourism is a small but significant component of the local economy with international visitors totaling almost 3 million in 2008. Taipei has many top tourist attractions and contributes a significant amount to the US$6.8 billion tourism industry in Taiwan. National brands such as ASUS, Chunghwa Telecom, Mandarin Airlines, Tatung, and Uni Air, D-Link  are headquartered in Taipei City. The National Taiwan Museum sits nearby in what is now 228 Peace Memorial Park and has worn its present name since 1999. The museum is Taiwan's oldest, founded on October 24, 1908 by Taiwan's Japanese colonial government (1895-1945) as the Taiwan Governor's Museum. It was launched with a collection of 10,000 items to celebrate the opening of the island's North-South Railway. In 1915 a new museum building opened its doors in what is now 228 Peace Memorial Park. This structure and the adjacent Governor's residence (now Presidential Office Building, served as the two most recognizable public buildings in Taiwan during its period of Japanese rule. The National Sun Yat-sen Memorial Hall near Taipei 101 in Xinyi District is named in honor of a founding father of the Republic of China, Sun Yat-sen. 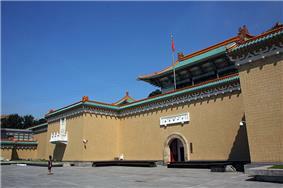 The hall, completed on May 16, 1972. originally featured exhibits that depicted revolutionary events in China at the end of the Qing Dynasty. Today it functions as multi-purpose social, educational, concert and cultural center for Taiwan's citizens. In 2001 a new museum opened as MoCA Taipei or Museum of Contemporary Art Taipei (臺北當代藝術館). 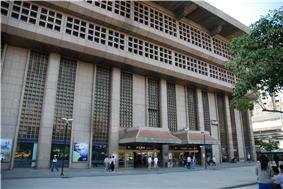 The museum is housed in a building that formerly housed Taipei City government offices. Taipei 101 is a 101-floor landmark skyscraper that claimed the title of world's tallest building when it opened in 2004, a title it held for six years before relinquishing it to the Burj Kalifa in Dubai. Designed by C.Y. 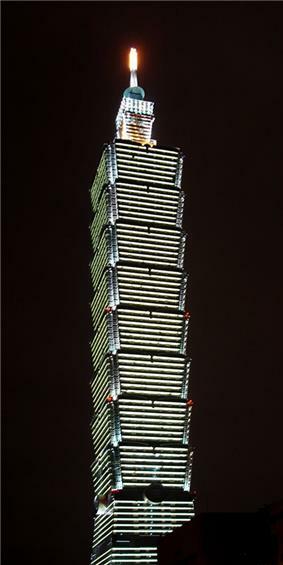 Lee & Partners and constructed by KTRT Joint Venture, Taipei 101 measures 509 m (1,670 ft) from ground to top, making it the first skyscraper in the world to break the half-kilometer mark in height. Built to withstand typhoon winds and earthquake tremors, its design incorporates many engineering innovations and has won numerous international awards. Taipei 101 remains one of the tallest skyscrapers in the world and holds LEED's certification as the world's largest "green" building. 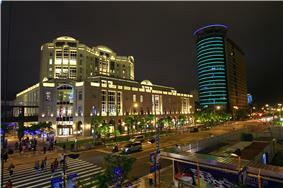 Its shopping mall and its indoor and outdoor observatories draw visitors from all over the world. 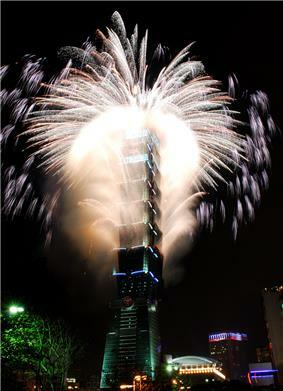 Taipei 101's New Year's Eve fireworks display is a regular feature of international broadcasts. 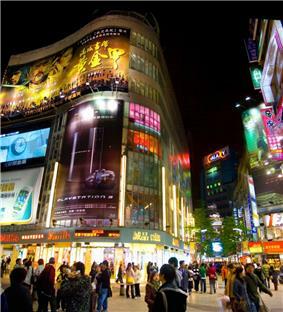 The newly developed Xinyi District is popular with tourists and locals alike for its many entertainment and shopping venues, as well as being the home of Taipei 101, a prime tourist attraction. Malls in the area include the sprawling Shin Kong Mitsukoshi complex, Taipei 101 mall, Eslite Bookstore's flagship store (which includes a boutique mall), The Living Mall, ATT shopping mall, and the Vieshow Cinemas (formerly known as Warner Village). The Xinyi district also serves as the center of Taipei's active nightlife, with several popular lounge bars and nightclubs concentrated in a relatively small area around the Neo19, ATT 4 FUN and Taipei 101 buildings. Lounge bars such as Barcode and Nightclubs such as Spark and Myst are among the most-visited places here. The spelling "Taipei" derives from the Wade-Giles romanization T'ai-pei. The name could be also romanized as Táiběi according to Hanyu Pinyin and Tongyong Pinyin. 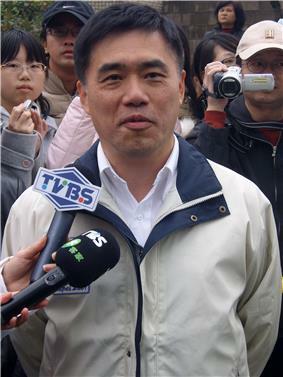 Hau Lung-pin, the incumbent Mayor of Taipei. 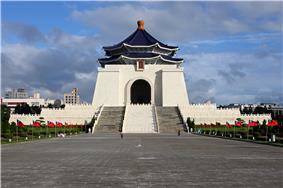 Taipei City is a special municipality which is directly under the Executive Yuan (Central Government) of ROC. The mayor of Taipei City had been an appointed position since Taipei's conversion to a centrally administered municipality in 1967 until the first public election was held in 1994. The position has a four-year term and is elected by direct popular vote. The first elected mayor was Chen Shui-bian of the Democratic Progressive Party. Ma Ying-jeou took office in 1998 for two terms, before handing it over to Hau Lung-pin who won the 2006 mayoral election on December 9, 2006. Both Chen Shui-bian and Ma Ying-Jeou went on to become President of the Republic of China. Taipei City is also famous for its effort in garbage recycling, which has become such a good international precedent that other countries have sent teams to study the recycling system. After the Environmental Protection Administration (EPA) established a program in 1998 combining the efforts of communities, a financial resource named the Recycling Fund was made available to recycling companies and waste collectors. Manufacturers, vendors and importers of recyclable waste pay fees to the Fund, which uses the money to set firm prices for recyclables and subsidize local recycling efforts. Between 1998 and 2008, the recycling rate increased from 6 percent to 32 percent. This improvement enabled the government of Taipei to demonstrate its recycling system to the world at the Shanghai World Expo 2010. Taipei City is divided up into 12 administrative districts (區 qu). Each district is further divided up into villages (里), which are further sub-divided up into neighborhoods (鄰). Public transport accounts for a substantial portion of different modes of transport in Taiwan, with Taipei residents having the highest utilization rate at 34.1%. Private transport consists of motor scooters, private cars, and bicycles. Motor-scooters often weave between cars and occasionally through oncoming traffic. Respect for traffic laws, once scant, has improved with deployment of traffic cameras and increasing numbers of police roadblocks checking riders for alcohol consumption and other offenses. Taipei's public transport system, the Taipei Metro (commonly referred to as the MRT), incorporates a metro and light rail system based on advanced VAL and Bombardier technology. 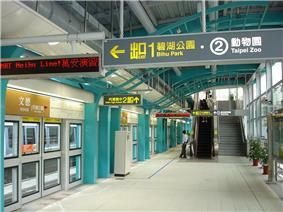 In addition to the rapid transit system itself, the Taipei Metro also includes several public facilities such as the Maokong Gondola, underground shopping malls, parks, and public squares. Modifications to existing railway lines to integrate them into the metro system are underway, as well as a rapid transit line to connect the city with Taiwan Taoyuan International Airport and Taoyuan County. Beginning in 1983, surface rail lines in the city were moved underground as part of the Taipei Railway Underground Project. The Taiwan High Speed Rail system opened in 2007. The bullet trains connect Taipei with the west coast cities of Banciao, Taoyuan, Hsinchu, Taichung, Chiayi, and Tainan before terminating at Zuoying (Kaohsiung) at speeds that cut travel times by 60% or more from what they normally are on a bus or conventional train. The Taiwan Railway Administration also runs passenger and freight services throughout the entire island. An extensive city bus system serves metropolitan areas not covered by the metro, with exclusive bus lanes to facilitate transportation. Riders of the city metro system are able to use the EasyCard for discounted fares on buses, and vice versa. Several major intercity bus terminals are located throughout the city, including the Taipei Bus Station and Taipei City Hall Bus Station. Most scheduled international flights are served by Taiwan Taoyuan International Airport in nearby Taoyuan County. Songshan Airport at the heart of the city in the Songshan District serves domestic flights and scheduled flights to Tokyo International Airport (also known as Haneda Airport), Gimpo International Airport in Seoul, and about 15 destinations in the People's Republic of China. Songshan Airport is accessible by the Taipei Metro Neihu Line; Taiwan Taoyuan International Airport is not yet accessible by rail but a line is under construction. 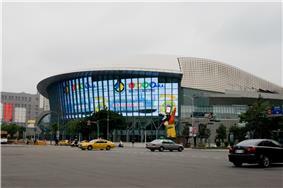 The Taipei Arena is located at the site of the former Taipei Municipal Baseball Stadium (demolished in 2000), with a capacity of over 15,000. Designed by Archasia, the arena was opened on December 1, 2005. Since its opening in 2005, the arena has held more art and cultural activities (such as live concerts) than sporting events, which it was originally designed and built for. The main arena has an adjustable floor space: its minimum floor space is 60 m × 30 m (196.85 ft × 98.43 ft), and can be extended to 80 m × 40 m (262.47 ft × 131.23 ft). The Chinese Taipei Ice Hockey League (CIHL) plays out of the auxiliary arena, which is a 60 m × 30 m (196.85 ft × 98.43 ft) ice skating rink. 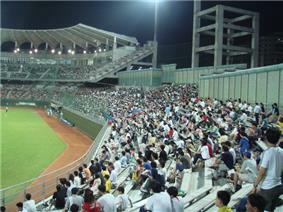 The Tianmu Baseball Stadium is the major basebal venue in Taipei. In 2010, a Taipei baseball team — Chung-Ching Junior Little League — won the Junior League World Series, after winning the Asia-Pacific Region, then defeating the Mexico Region and Latin America Region champions to become the International champion, and finally defeating the U.S. champion (Southwest Region), Rose Capital East LL (Tyler, Texas), 9-1. Newspapers include Apple Daily, Central Daily News, The China Post, China Times, Kinmen Daily News, Liberty Times, Mandarin Daily News, Matsu Daily, Min Sheng Bao, Sharp Daily, Taipei Times, Taiwan Daily, Taiwan News, Taiwan Timesand United Daily News. ^ "Demographia World Urban Areas PDF (March 2,013)". Demographia. Retrieved 24 November 2,013. ^ a b "Taipei City Government: Home – I. Geographic Overview". Taipei City Government. 2006-10-23. Retrieved 2009-08-04. ^ a b c "鄉鎮市區人口及按都會區統計". Taiwan Ministry of Interior. December 2009. Retrieved 2010-07-11. ^ "The World According to GaWC 2008". Retrieved 2010-01-25. ^ a b c Marsh, Robert (1996). The Great Transformation. M. E. Sharpe. p. 84. ^ a b Ng, Franklin (1998). The Taiwanese Americans. Greenwood Publishing Group. p. 10. ^ "History". Taipei City Government. 2004-03-29. Archived from the original on May 7, 2005. Retrieved 2009-08-11. ^ Kelly, Robert (2007). Taiwan. Lonely Planet Publications. p. 46. ^ a b c d "History of Taipei". Taipei City Government. Retrieved 2009-08-11. ^ a b Marsh, Robert (1996). The Great Transformation. M. E. Sharpe. p. 85. ^ Republic of China Yearbook. Kwang Hwa Publishing Co. 2002. p. 120. ^ "About Taipei – Taipei Profile". Department of Information and Tourism, Taipei City Government. Retrieved 2009-07-14. ^ a b "Geography/Population". Taipei City Government. 2004-03-29. Archived from the original on January 27, 2005. Retrieved 2009-08-11. ^ Oung, Angelica (2007-05-04). "Taipei air pollution alarming: scientists". ^ Kwok, R. Yin-Wang (2005). Globalizing Taipei: the political economy of spatial development. Routledge. p. 163. 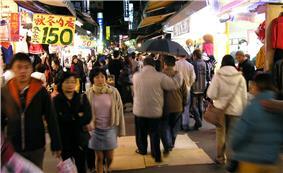 ^ "Taipei City Has Second-highest Per Capita GDP in Asia: TIER". China Economic News Service. 2009-03-19. Retrieved 2009-07-13. ^ a b "Taipei City Today". Taipei City Government. 2004-08-17. Retrieved 2009-08-11. ^ "歷年觀光外匯收入統計". Tourism Bureau, Ministry of Transportation and Communication. Retrieved 2010-01-24. ^ "97年臺閩地區主要觀光遊憩區遊客人次月別統計". Tourism Bureau, Ministry of Transportation and Communication. Retrieved 2010-01-24. ^ "ASUS set to storm eBook reader market". 2010-01-25. Retrieved 2010-01-26. ^ "Chunghwa Telecom 2008 Form 20-F filed with the U.S. SEC." Chunghwa Telecom. Retrieved on June 2, 2010. ^ "Company Profile". Tatung Company. Retrieved 2010-01-24. ^ "Directory: World Airlines." Flight International. March 30–5 April 2004. 88. ^ "關於立榮航空." at the Wayback Machine (archived January 3, 2008) Uni Air. January 3, 2008. Retrieved on March 15, 2010. ^ "Global Operations – Global Headquarters". D-Link Corporation. Retrieved 2010-10-20. ^ "2014 Global Destination Cities Index". MasterCard. Retrieved 2014-07-10. 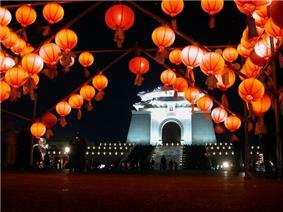 ^ "National Chiang Kai-shek Memorial Hall". 2009-05-05. Retrieved 2009-08-09. ^ a b "National Taiwan Museum: History". National Taiwan Museum. Archived from the original on April 22, 2008. Retrieved 2009-08-09. 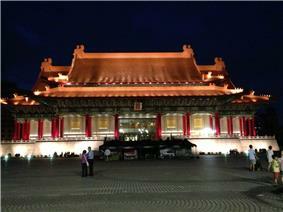 ^ "Taipei's National Palace Museum". BBC. Retrieved 2008-06-04. ^ "History and Introduction of the Hall". Retrieved 2009-08-09. ^ "From History to Contemporary". Museum of Contemporary Art Taipei. Retrieved 2009-08-09. ^ Basulto, David (12 February 2012). "OMA’s Taipei Performing Arts Center breaks ground". ArchDaily. Retrieved 9 August 2012. ^ Kelly, Robert (2007). Taiwan. Lonely Planet Publications. p. 99. ^ Iwabuchi, Kōichi (2004). Feeling Asian modernities: transnational consumption of Japanese TV dramas. Hong Kong University Press. p. 111. ^ "Transformation of "Liugong Canal" – Looking Back on Xinsheng South Road". Department of Rapid Transit Systems. 2008-10-01. Retrieved 2010-07-22. 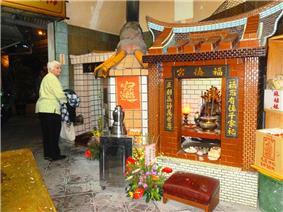 ^ "Longshan Temple, Baoan Temple, and Xiahai City God Temple: Taipei’s Glorious Heritage-Site Temples". Department of Information Technology. 2009-01-29. Retrieved 2010-07-22. 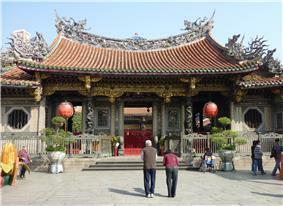 ^ "Taipei Confucius Temple". Datong District Office, Taipei City. 2010-05-26. Retrieved 2010-07-22. ^ a b "CHAPTER 19 Tourism". Republic of China Yearbook 2008. ROC Government Information Office. Retrieved 2009-07-14. ^ Skinner, G. William (1973). Modern Chinese society:an analytical bibliography. Stanford University Press. p. 55. ^ "Gov't to improve English-friendly environment". The China Post. 2008-09-18. Retrieved 2008-09-20. ^ Kwok, R. Yin-Wang (2005). Globalizing Taipei. Routledge. p. 201. ^ "Recycling: Taiwan’s Way of Life". Taiwan Review. 2010-03-01. Retrieved 2010-08-31. ^ a b Jones, Ian (2008). City Museums and City Development. Rowman & Littlefield. p. 102. ^ "Metro Tickets". Taipei Rapid Transit Corporation. Archived from the original on August 22, 2008. Retrieved 2009-07-14. ^ "CHAPTER 13 Transportation and Telecommunications". Republic of China Yearbook 2008. ROC Government Information Office. Retrieved 2009-07-14. ^ "National Taiwan University – About NTU". Web.archive.org. 2007-08-06. Archived from the original on 2007-08-06. Retrieved 2009-07-27. ^ a b c d "Taipei City Council". Retrieved 2007-02-24. ^ "Miasta partnerskie Warszawy". um.warszawa.pl. Biuro Promocji Miasta. 2005-05-04. Retrieved 2008-08-29. ^ "Twin cities of Riga".